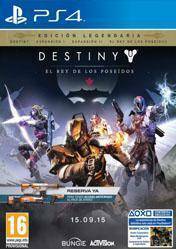 Buy Destiny The Taken King Legendary Edition for PS4 at best price is already possible through Gocdkeys. Below we indicate in which online store is cheaper to buy Destiny The Taken King Legendary Edition for PS4 (in physical or digital format). Destiny The Taken King Legendary Edition is the perfect choice for new guardians, and for veterans, who are ready to embark on the universe of Destiny. This Legendary Edition contains all the DLC or expansions of Destiny, including tThe Taken King, the new evolution of the Universe Destiny, Expansion I: The Deep Dark and Expansion II: Wolfs house. At Destiny, we will be a guardian of the last city on Earth, which we must protect at all costs. It is a multiplayer first person shooter that offers an unprecedented combination of history, fully integrated into a massive, persistent online world and cooperative, competitive, public and personal activities. The Taken King, we will have at our disposal a new campaign, new missions, new enemies to fight, new locations to explore, new maps new incursions Assault and more. Players will have access to three new subclasses of guards and a whole new arsenal of weapons, armor and equipment to keep up with the growing challenges that we will find. We recommend reading all the information on payment methods and shipping times in each store. There are no comments yet about Destiny The Taken King Legendary Edition. You can be the first one! Destiny The Taken King Legendary Edition Review! - WORTH BUYING?